The structure indicated is the extensor digitorum brevis muscle. This muscle is the only intrinsic muscle of the foot located on the dorsal aspect, and serves to extend digits 2 to 4. Insertion: Base of proximal phalanx of great toe, lateral portion of tendons of extensor digitorum longus of toes 2 – 4. Action: Extension of great toe at MTP joint. Flexion of toes 2 – 4. 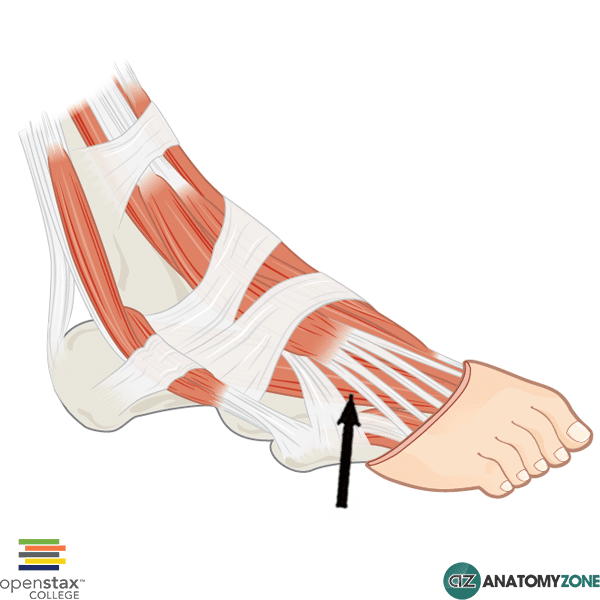 Learn more about the anatomy of the foot muscles in this tutorial.